An 82-year-old journalist who covered both the 1948 and 2012 Olympic Games in London has been named in the Queen’s Birthday Honours List. Patrick Rowley was just 14 when he helped cover the 1948 Games for his local paper, the Middlesex Chronicle. More than six decades later, he provided coverage of the hockey events at London 2012 as a 78-year-old freelance. Patrick, below, of Woodford Green, was awarded the British Empire Medal in last weekend’s honours list for his outstanding services to hockey. Patrick first developed an aptitude for as a seven-year-old schoolboy when he started a school magazine, partly to cover the results of the school football team. He was sent to the 1948 Olympics after persuading the editor of the Middlesex Chronicle, who also captained his cricket team, to let him report. 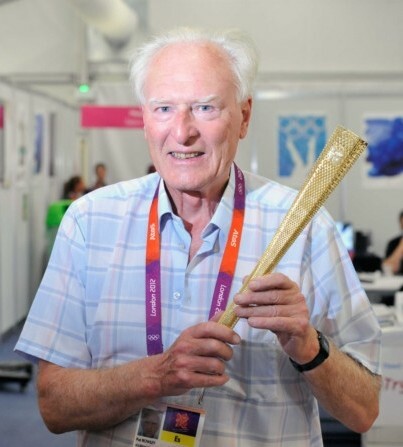 Since 1948, Patrick has reported on 14 Olympics, and was presented with a replica Olympic torch in 2012 to honour his work. He has also covered every World Cup and reported on sport for most national newspapers. As well as reporting on hockey, Patrick is still a keen player and won his first national title this year at the age of 82, representing south England in the divisional over-75 tournament. “I recently played against an 86-year-old and he was very pleased to see me. The problem was they put us both on the same side and we were probably the slowest full backs,” he added.